Opinion: Beyond the Monuments, Richmond Needs True Context About Slavery | Back Page | Style Weekly - Richmond, VA local news, arts, and events. Scott Elmquist The bronze statue of Confederate President Jefferson Davis was sculpted by Edward V. Valentine and was dedicated in June 1907. “These monuments constitute a default endorsement of a shameful period in our nation and in our city — one that does a disservice to the principles of racial equality, tolerance and unity,” Stoney went on to say. He reminded us that during the period when the statues were erected, between 1890 and 1919, Jim Crow laws reduced the number of African-American voters in Virginia from almost 150,000 to fewer than 10,000. The mayor asked the commissioners to find a way to tell the complete story of Richmond’s central place in our nation’s long history of racism, exploitation and inequality. But now, following the recent events in Charlottesville, he has changed his mind, expanding the commission’s purview to include the possibility of removing or relocating the monuments — an option that seems to be gaining more public support by the day. The experienced and diverse panel the mayor assembled faces a challenging task. There are Richmonders who want to see the monuments come down. Others may reject all the Confederacy stood for and yet wish to retain the monuments as a reminder of the violence and injustice they represent. And still others will defend the monuments as a paean to Virginian heritage, rather than a tribute to the white supremacy that other modern-day residents want to disavow once and for all. The commission will be hard-pressed to devise a plan accommodating these divergent viewpoints. The mayor has said he leans toward somehow providing a historical context for the monuments, rather than their removal. 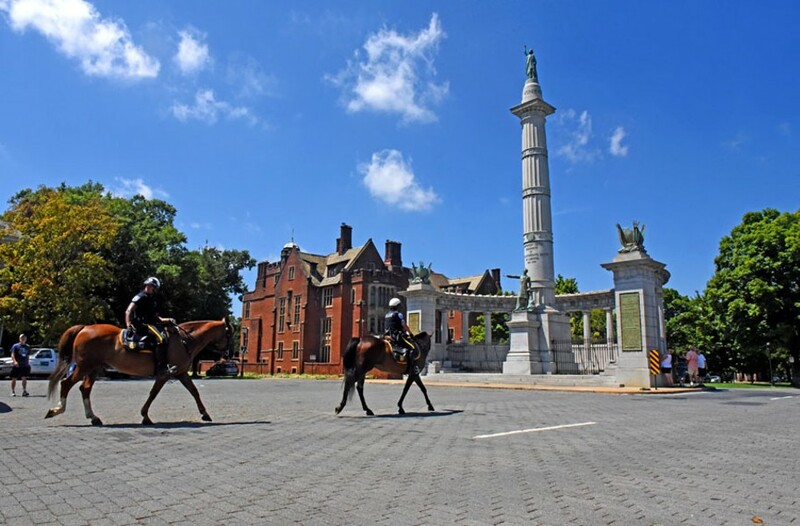 He wants the commission to find a way Richmonders and visitors to the city can face the truth — that the Monument Avenue statues glorify defenders of a way of life dependent on the subjugation and ownership of millions of people by other human beings. And further, that they represent the continued exploitation of African-Americans following the Civil War — institutionalized racism that still reverberates in the life of our city and nation in the 21st century. Given the recent events in Charlottesville, it seems clear that the Monument Avenue Commission should widen its scope to consider the possibility of removing or relocating the monuments. In its efforts to tell Richmond’s whole story, the commission should also turn its eyes eastward, toward the oldest and most historic section of Richmond, Shockoe Bottom. From about 1830 through the end of the Civil War, Shockoe Bottom was, along with New Orleans, the epicenter of the U.S. trade in human beings. Hundreds of thousands of people were bought and sold in this central business district. Enslaved people were sold to work the fields of the Deep South. Families were broken apart — young children were torn from their parents. Women and girls were sold like livestock to breed additional laborers, or for sexual gratification of their white owners. Gabriel and some of his followers were executed here for trying to overturn this brutal system. This trade turned Richmond from a small town into a bustling commercial hub and built the fortunes of many wealthy families. For more than a decade, community activists and historic preservationists have urged that we memorialize this terrible part of Richmond’s history in Shockoe Bottom. Several years ago, the historic section was threatened with entombment beneath an ill-conceived baseball stadium. That battle seems to have been won. Now the city has hired a team of architects and design consultants who are developing a plan to preserve a small section of the district as the Lumpkin’s Jail site. But the remainder of the historic Shockoe district remains at risk. That includes the 3.1-acre African Burial Ground, reclaimed after a sustained community struggle from its previous use as a Virginia Commonwealth University parking lot and curiously not included in the city’s plan for Lumpkin’s Jail. The consultants have held several meetings to gather feedback. At each of these sessions, the public response has been overwhelming: Preserving the Lumpkin’s site is insufficient. Instead, preservationists and community members have offered an alternate plan — a memorial park encompassing 9 acres of land — most of which is currently vacant or used as parking lots. Buried beneath are decades of history. In the 1800s, this land included six to eight other establishments, like Lumpkin’s, where enslaved people were held and sold, along with offices of slave traders, hotels, restaurants, dry goods stores, banks and other commercial establishments that supported and profited from the slave trade. Despite repeated calls for the city to purchase the acreage with the substantial funds already set aside to preserve the area, or at the very least to designate a specially zoned district to prevent development from disturbing its archaeological and historic heritage, the city has yet to act. Paul Fleisher is a retired public schools educator.